“For some reason I always liked the extra crap at the end of skate videos and theres probably people out there like me also so here is the bonus from the first Truth DVD, enjoy” – Austin Paz. Check out the full video of The Truth below featuring Austin Paz, Billy O’Neil, Chris Cheshire, Colin Kelso, Franco Cammayo, Sean Kelso and more. It’s only been two days since the Bitter Cold Show Down went down and there are already a ton of edits online. I gathered up all the edits that feature some of our local talent and posted them up to show you how NYC was represented at the BCSD. The edits feature Valo AM’s Franco Cammayo and Austin Paz, USD pro Billy O’Neill, and Remz flow rider Dave Lang. All the NYC skaters laced some major hammers so here’s a thank you to all of them for representing our city during the competition. The Truth 2 Premiere and Box Jam in NYC Today! The most anticipated film of the year (technically two years) will premiere today! Skate Life Pro-Motion and Create Originals are presenting The Truth 2 for your viewing pleasure today starting at 6:00pm at the St. Patrick Youth Center in Manhattan, NY! I Roll NY will be handing out early holiday gifts (limited quantity) for Create Original supporters at the premiere so make sure to say hi if you’ve got a pair of CO’s. Bring your friends, family, and skates with you tonight to session before and after the screening. Remember there is a $5 entrance fee with proceeds going to Cozmik’s family fund. Information is on the flyer above. Google Maps link here. Be there! P.S. 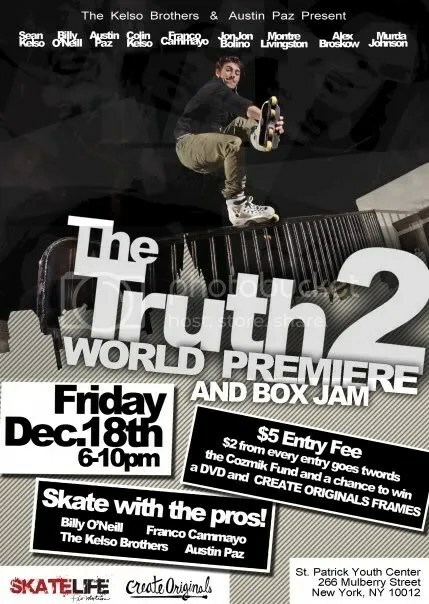 If you can’t make it out tonight Tri-State Skate is having their premiere of The Truth 2 this Monday. Info here. Be-Mag has released a few sneak peak photos of their upcoming issue. Issue 34 will include a Matthias Ogger Interview, Oli Short Interview, Michael Garlinghouse Profile, Rolling Artist: Ryan Schude, Roskilde Sessions, catching up with Jeph Howard and much more. On the NYC side of things Billy O’Neil is featured in the Soul Stealing section with a 180 (I think) over the bank featured above. See more sneak peaks from Be-Mag issue 34 here. Don’t you just love living in NYC? We have the best scene, we have the best website, and now we’re going to have what will definitely be the best premiere of the best NYC/East Coast video. Skate Life Pro-Motion and Create Originals are presenting The Truth 2 for your viewing pleasure Friday, December 18th starting at 6:00pm until 10:00pm at the St. Patrick Youth Center in Manhattan, NY. At the premiere you’ll not only be able to see the Truth 2 and purchase the DVD but you’ll also have a chance to skate with some of the cast from The Truth 2, win a copy of the DVD and also win a pair of Create Originals. The entrance fee is $5 and part of your fee will go to our lost friend Cozmik. Information is on the flyer above. Google Maps link here. Be there! Sean Kelso uploaded this lost montage from the first installment of the Truth. Featuring spots from Philly and NYC and featuring the Truth crew, Billy O’Neil, Franco Cammayo, Austin Paz, Colin Kelso, Sean Kelso, Chris Cheshire, Erik Stokley and more. There will also be a Truth 2 premiere in NYC this month so stay tuned for details. “From the first installment of The Truth video series. Featuring The Truth Crew, Erik Stokley and others. I found this edit of unused footage that was completely forgotten about and 3 years old. Enjoy. Believe the Truth and check out the 2nd video! Song by blockhead” – Sean Kelso. Thanks to Joseph Perez and the iMagyne crew for coming out and showing their support and creating this dedication edit. Thanks to everyone who came out and got on camera to say their peace. “I would like to thank I Roll NY, Wheels In Motion, and EvoTek for helping put this event together. We Will Miss you Brian Cozmik Scott. This is one of the ways for him to live on and for us to remember him. I hope you guys enjoy it…To Brian “Cozmik” Scott I never met you but I will always respect you and love you for the person that I have been told you were. R.I.P Cozmik” – Joseph Perez. Also Jason Staine of Rolling Film Media was in attendance during the session and captured some footage of everyone and some of the tricks that went down. Jason’s footage is more about the ambiance of the crowd rather than the tricks so it gives off a more relaxed vibe. Jason also caught Victor’s opening speech so take a look at how the day went. This is pretty much raw footage so not a lot of editing is done. 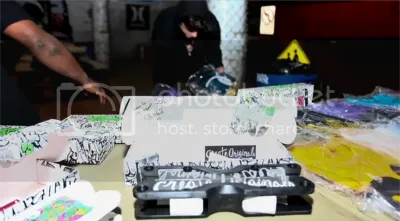 “The Create Originals co-owners took the 8 hour drive trip out to the “Rolling Rumble” contest that went down at Xtreme Wheels skate park in Buffalo, New York last Sunday. We arrived at Buffalo late Saturday night and decided since Niagara Falls was only 10 minutes away that it was to close not to visit the next day. Our trip to one of the worlds natural wonders was on a misty day so visibility wasn’t as great as it could have been but it was still an amazing site. We then headed to the skate park where we were welcomed by one of the owners Virginia who could not have been more hospitable and she’s is also extremely down for skating. Her family runs the only park in town which basically keeps the Buffalo skate scene alive during the cold winter months. After greetings from the staff and locals and a tour of the immense facility, we set up the goods and spent the day watching the comp go down and explaining the product to the eager and curious locals. After the contest wrapped up and we gave away some frames to the winners, we decided to get some quick clips before immediately heading on our way back to Boston. This edit features all 3 co-owners, Billy O’Neill, Brian Lewis, and Hakeem Jimoh late night at the skate park” – Create Originals. Billy O’Neil Photos By: Derek Gee. Xtreme Wheels Skatepark has been featured in The Buffalo News website where they feature photos of Billy O’Neil and Eric Hallimen skating the park with a brief description of the competition. Check out all the photos at The Buffalo News website. Thanks to Virgina Clark of Xtreme Wheels for the heads up.